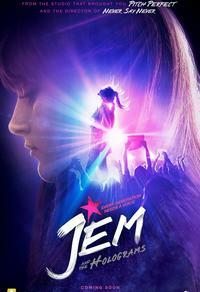 It's really a shame to see what Hollywood has done to Jem and the Holograms, as this could have easily been turned into a really fun, music-driven action franchise. It's a sentiment that will undoubtedly be shared by any adults forced to chaperone their kids to this desperately cynical exercise. Pour alourdir le bilan, l'ensemble se distingue par l'incroyable manque de goût des stylistes, qui empruntent sans discernement à David Bowie époque Zyggy, à KISS et à Lady Gaga. Malgré les contributions de la piquante Juliette Lewis et de la rassurante Molly Ringwald, l'interprétation d'ensemble se révèle médiocre. But if you never had much investment in the Holograms, and aren’t expecting any singles as great as “Three Small Words” from “Josie and the Pussycats,” you may find this bubblegum musical more of a toe-tapper than you might have imagined. I don't know what I expected going into the movie, but it wasn't a coming-of-age drama that compensates for its near plotlessness with charming and sometimes touching performances (...). Justin Bieber's docu director struggles to create an entirely faux pop star in this '80s toon series adaptation.